The bottom line for those that, understandably, don’t want to read this abhorrently long and detailed explanation: We broke down leaving Estes Park near Rocky Mountain National Park in Colorado, got towed to Sumner Automotive in the small town of Milliken, where they diagnosed sticking solenoids, loose wires and a heavily damaged transmission clutch. 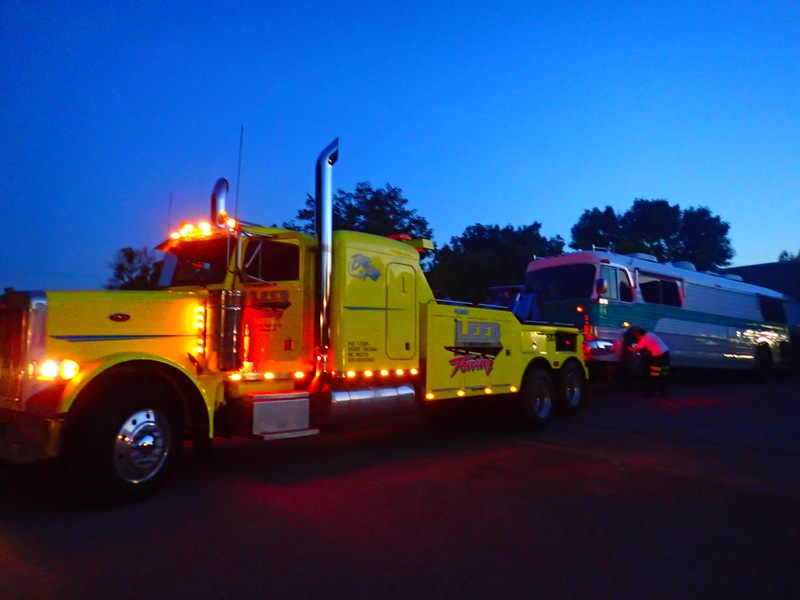 Said clutch was beyond their shop’s repair capability, so we got towed further down the road to Greeley where B&G Equipment removed the transmission, eventually sending it all the way to California for a rebuild after failing to find anyone in Colorado willing to fix it. Jeremy, owner of Lee’s Towing, getting us ready to tow. In three recent posts I hinted that we had recently experienced another significant mechanical problem. Here is the full sordid tale: As we were departing Estes Park with the intention of visiting the Dakota Badlands before again turning east towards Chicago, The Big Kahuna’s transmission began to force itself into a higher gear, causing us to stall out on a mild uphill grade. 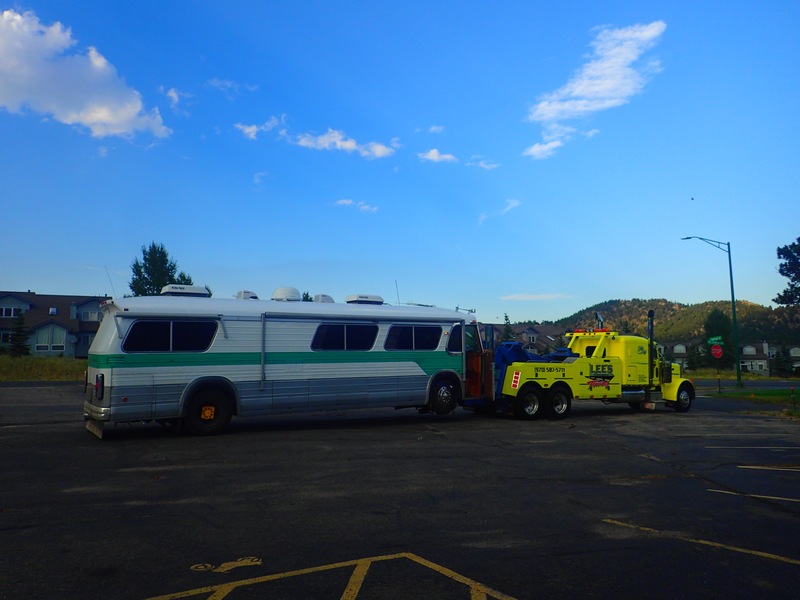 This had happened before, during our shift of RV parks while in Moab, but back then the situation resolved itself after a few minutes. I had nervously hoped that it was just a transient signal; a hiccup involving a sticky solenoid or something. Alas, the problem came back, and this time my attempts to reset the transmission were to no avail. 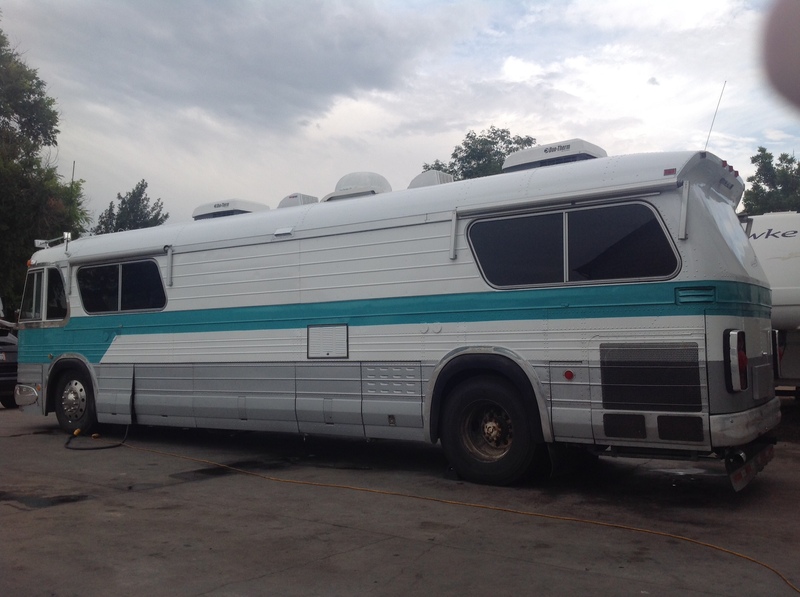 I called around to every mechanic in Estes Park, and only one was willing to even consider working on the bus, but only if we brought it in to their shop, less than half a mile away. Though with careful use of throttle I could nurse the bus along on a flat or downhill grade, I didn’t think I could make the hill leading up to their place. I convinced them to send their mechanic for a quick look, they kindly did so, but he assessed that even troubleshooting the problem would be beyond the capability of their car-focused shop. Lacking any local options, we were forced to call Progressive (again!) and request a tow. They were at first resistant to doing the research on where to tow us, but after some pushing they checked their database and found a shop. Meanwhile, I was making my own calls to mechanics in nearby towns such as Longmont or Greeley. During the course of those calls I learned from a helpful RV repair shop that the company to which Progressive was planning on towing us had been out of business for several years! Needless to say, the Progressive subcontractor in charge of their roadside assistance and I had some additional pointed conversations, and they got a bit more proactive. At my insistence they actually called the next intended destination to verify it existed and would be willing to work on The Big Kahuna. In the meantime, I managed to nurse the bus into the adjacent parking lot of a closed down small business of some sort, giving us a safer place to spend the hours awaiting our tow truck. Some hours later Jeremy, owner of Lee’s Towing, arrived from the small town of Milliken, and after an hour or so of hard prep work had us lifted and ready to go. Jeremy also made some calls to Sumner Automotive Repair, a shop in his hometown that worked on all sorts of diesel vehicles, as well as holding the maintenance and repair contract for the local school district’s school buses! Perfect. 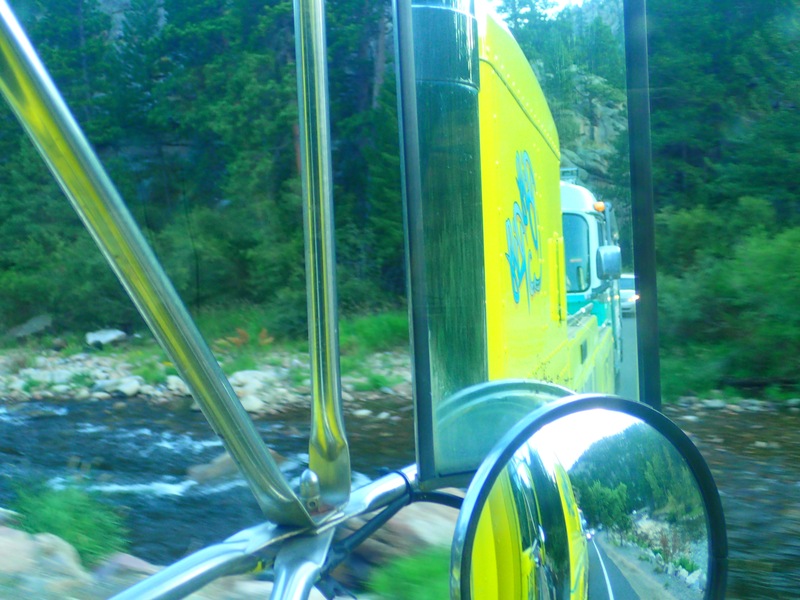 Progressive agreed to the change the tow destination, particularly since it was significantly closer than the basic RV repair place they had found. An hour later we pulled into Sumner Automotive, met Branden (the owner) and his family, and got settled into their driveway awaiting service. Branden had warned us that it would be a couple of days before he could give us any attention due to his busy shop, existing customers, and the bus and truck contracts that took priority. But he went out of his way to make our stay as comfortable as possible, hooking us up to electricity, providing water for our tank, and giving us access to his internet. We were, effectively, at a comfortable partial hook up RV park, and we had no problem waiting a few days until he could get to us. 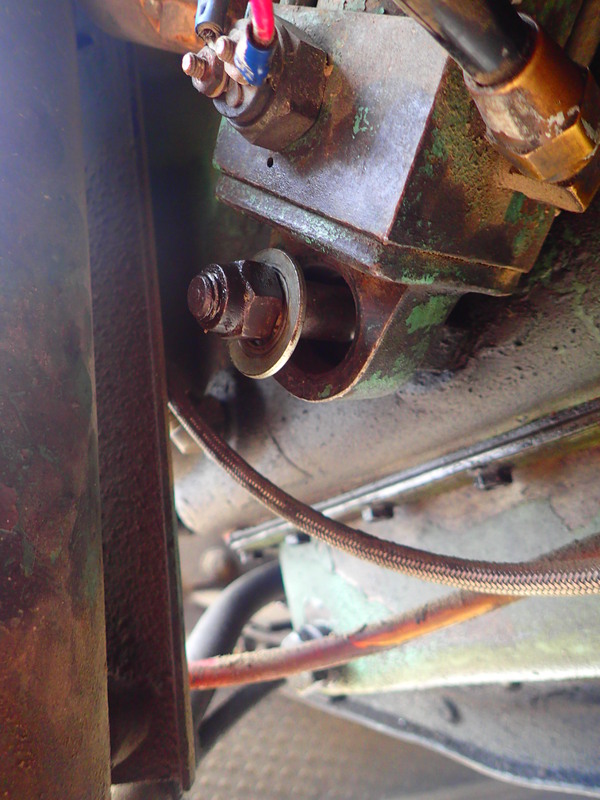 The age of our bus and the idiosyncrasies of the system gave Sumner’s mechanics fits figuring out the problem. 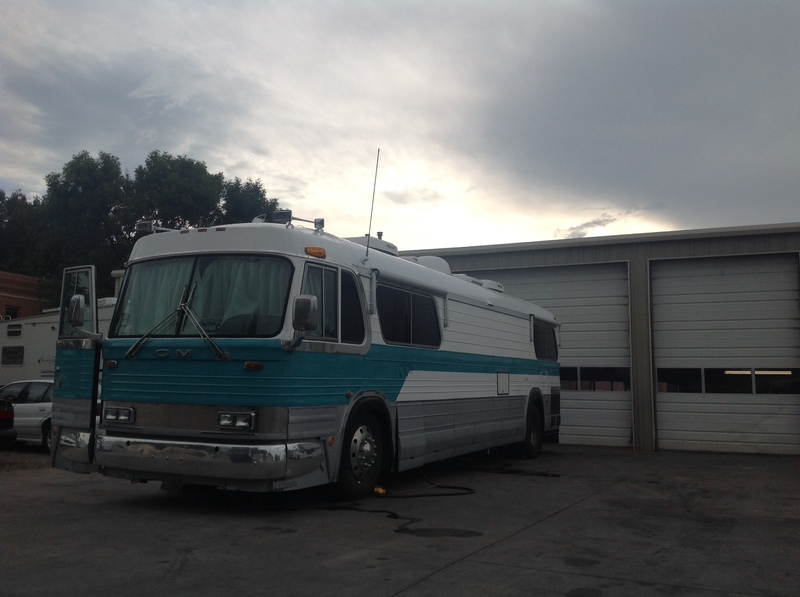 We were able to make some progress, partially since I have the original manuals and also because I managed to get Ted from Coach Maintenance Company on the phone with Branden to consult. They dismantled and cleaned up several possibly sticking solenoids, reattached some loose wires and grounds, and may have fixed the original cause of our problems, but unfortunately they also determined that something was going very wrong with the clutch. 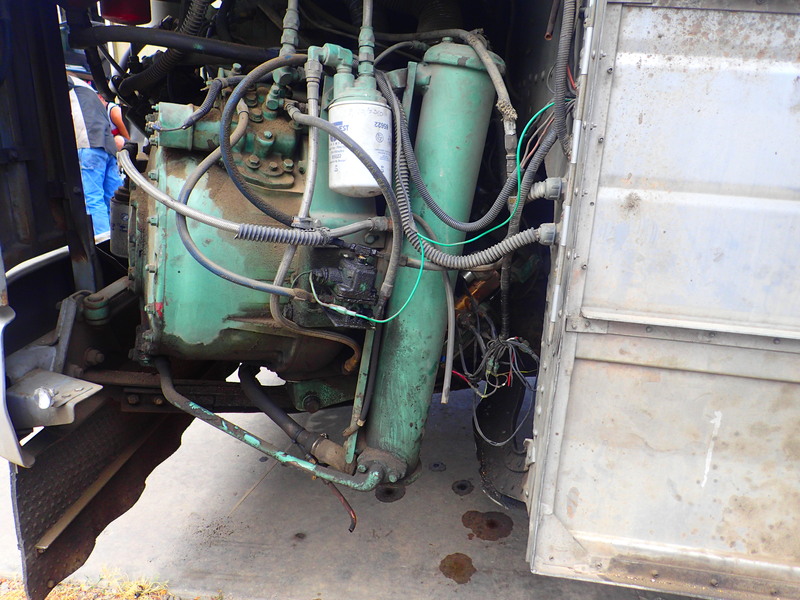 By he end of the week Branden had arranged an outside mechanic that used to work older diesel systems like ours to come by for a consult, and he stated with confidence that our clutch was burned out. Branden did not feel that his shop could effect a transmission clutch rebuild in a system as old and large as ours, but he used his contacts and influence to find a place that would, B&G Equipment in Greeley, CO. I am pretty sure that this same place had turned the job down when it was me calling on the day of the original breakdown, but they appear to have given Branden some professional courtesy. After a tense call with Progressive, they agreed to extend the tow to the new shop as part of the covered policy. Thus we spent the weekend enjoying the hospitality of the Sumner family, before Jeremy towed the Big Kahuna to B&G on Monday morning. During the weekend, as our path forward had become clear, we finalized a plane ticket from Denver to Chicago in order to catch our long ago purchased flight to London to visit family. Jeremy came through for us again as it turned out that after dropping off the bus in Greeley he was scheduled to go down to Denver for a job, so he gave us a ride, which saved us an expensive taxi or Uber trip. I can’t say enough good things about three major players during this entire fiasco: Progressive Insurance came through with a double leg tow fully covered by our policy, Jeremy at Lee’s Towing got us safely to two mechanics and dropped us off in Denver, and Branden and his entire family at crew Sumner Automotive who showed us such hospitality during our stay in his parking lot. We are hopeful hat B&G and the subcontractor in California doing the transmission rebuild will leave us as satisfied. 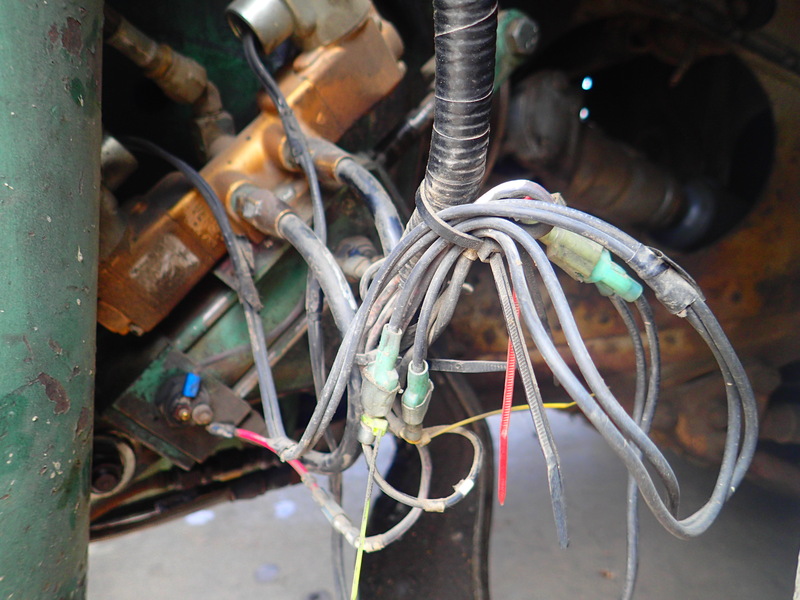 What’s the tally so far this year for motorhome repairs? Well north of $20K this year alone. Far more than we anticipated, though to be fair a lot of that s in optional upgrades and improvements such as the new paint, Michelin tires, bathroom, and engine brake. Pure repair pushing close to $10K. Darlings, Sorry you’re having mechanical problems – I guess it’s similar to upkeep on a home! However, we would also love to hear about the fun you are having, great places you are seeing, and the people you are meeting! If you could be so kind as to send us a little more of the fun and good news, it sure will be great!! More to come in that arena, OR. But we promised to “keep it real” with regard to this lifestyle, so the good with the bad!